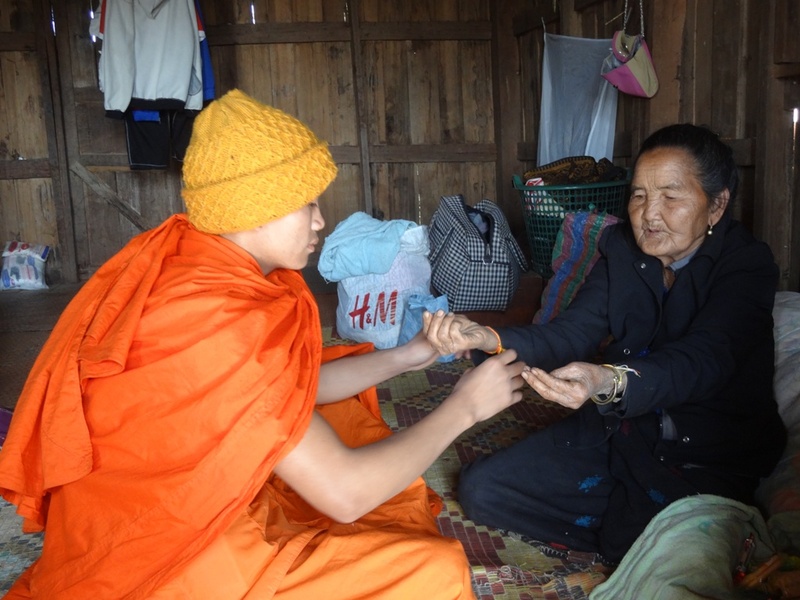 A few weeks ago I accompanied one of my novice students, Kham, to his village. It was my first time to visit a village of my students and I was very excited to go there. Kham, who is Khmu (the second largest ethnicity in Laos) told me a lot about his home town and I was looking forward to seeing another side of Laos as Luang Prabang is definitely NOT representative of the country. 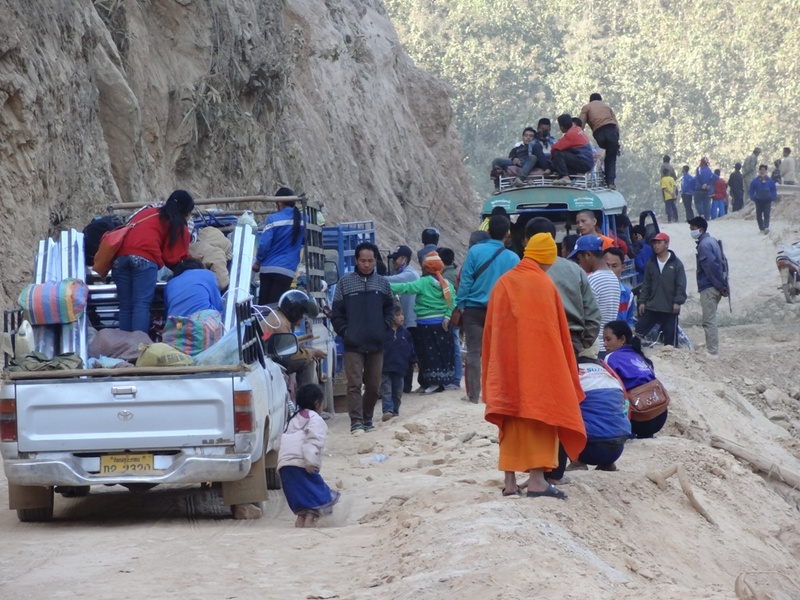 We were going to meet his sister who studies in a city south of Luang Prabang at the bus station and would then join her in a car to their village. One of the things you learn when you live in Laos is that the term ‘car’ doesn’t necessarily mean the same thing as a car in the Western world. Here a car can be a truck, a van, a tuk-tuk – or – a car. We arrived at the bus station at 9 am after we received a call from Njay, Kham’s sister, telling us that they would be there soon. At 10 am we found out that they had a problem with the car (oil leakage) and that they were getting it fixed at a shop and would be there a bit later. At 12 o’clock his sister said they were on their way and that the car would be quite full as many of the young people from her hometown who study in the same city all were going to go home to their village (it was school holiday) which made me think that we might have to squeeze together in the back of the car and that it could be quite challenging as we were going to face a 4-5 hour ride. When Njay called us at 1.30, saying that they had just missed the bus station and that we should run along the street couple of hundred meters to meet them a young kid grabbed my big bag (full of fruit and vegetables for Kham’s family) and helped me carry it to the car. 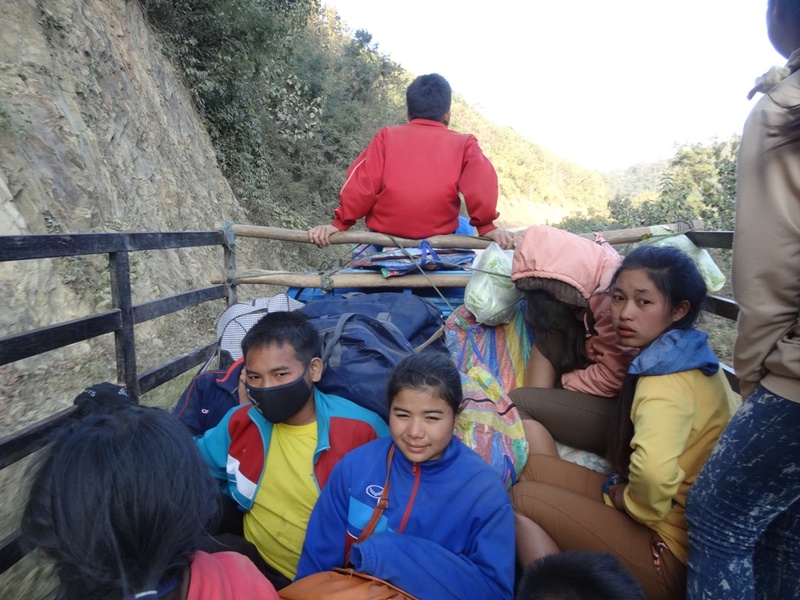 The ‘car’ turned out to be an old pick-up truck, and it was loaded with 21 teenagers on its ladeflaeche. My heart almost stopped when my brain cells put 1+1 together and I thought to myself ‘HOW on earth will I EVER survive such a long ride, perched together like on an animal transporter. They threw my bag on the truck and motioned to jump on. ‘But where do I have space?’ I asked, and some guys who were in the very back of the truck leaned out even more and my seat for the next 6 hours was a bucket of paint, amidst tons of bags full of cabbage, vegetables and 21 kids who probably wondered what a falang was doing on the truck with them. I learned how to make the most awkward knots into my far-too-long legs and made friends with some of the students who were all absolutely cool and charming. I practiced some English with some interested students and learned a Khmu phrase here and there (the Khmu speak a different language from the Lao Language). The first stretch to the biggest (and only one) town on the way, Pakseng, was 2.5 hours on the dustiest road I have ever been on. About 90% of the road was sand and earth, in some areas as deep as 20 cm. I amusingly watched one of the girls beautiful black hair turn whiter and whiter the further we got and we were all covered with red and yellow sand from toe to head. 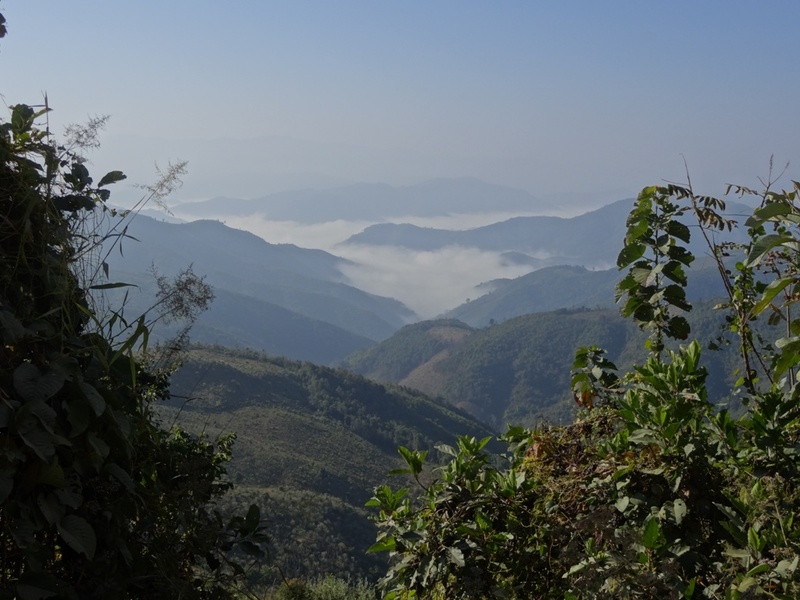 From Pakseng to Kham’s village, Mok Thanet, it was another 2 hours steep up the mountains. 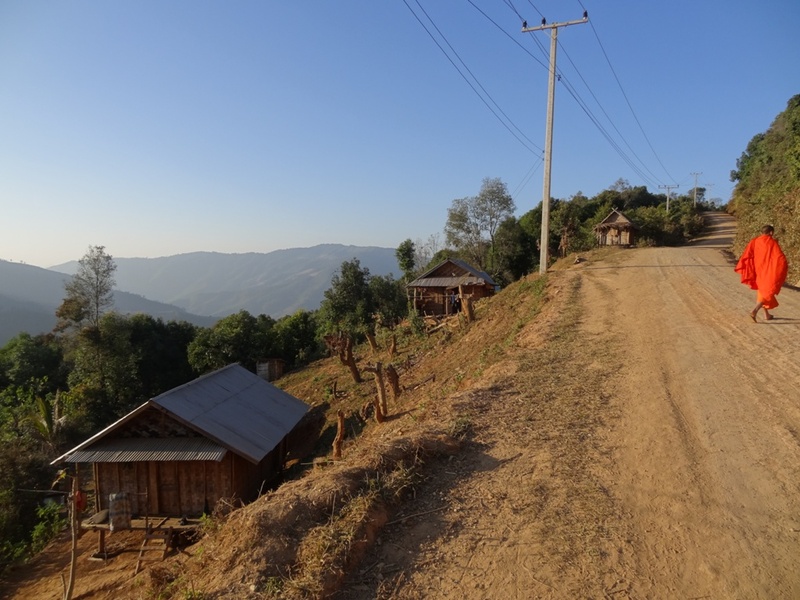 The landscape and hills are a beautiful sight and the incline of the street was so steep that the old truck wasn’t able to take the weight of 21 in the back plus 7 in the front so we often had to get off the truck and walk a few hundred meters to the next flatter stretch. 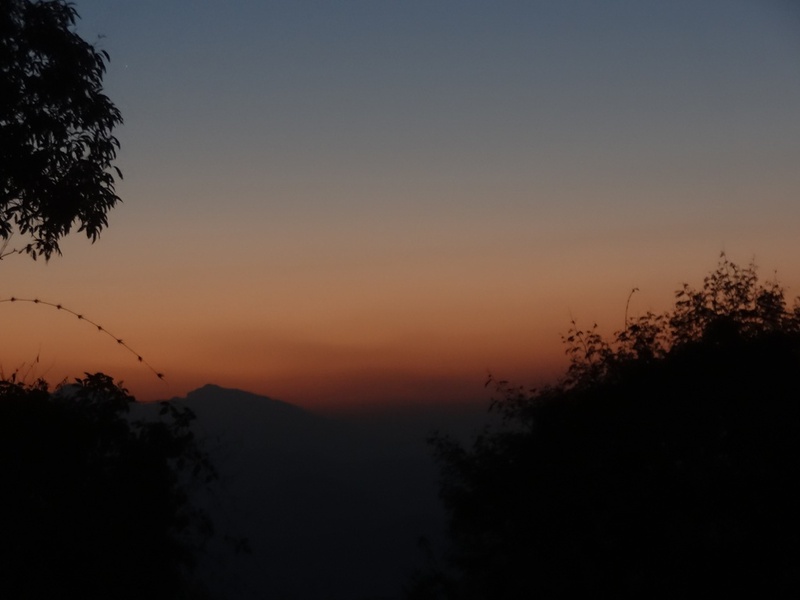 The sunset was purple and pink and soon after that millions of stars lit the pitch dark night. I stared up into the sky and thought that this was the most challenging but also unique drive I had ever done and it was yet another memorable and not-to-miss experience. 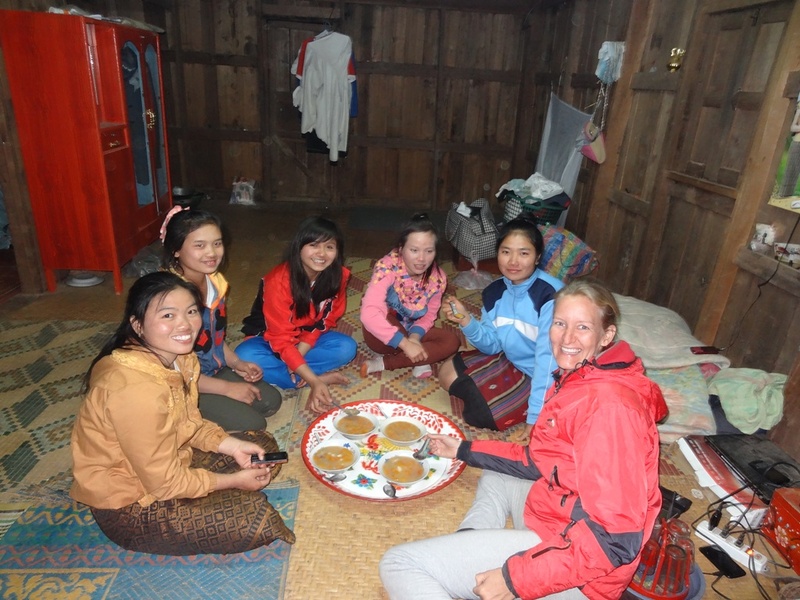 Kham’s family greeted us and his father, stepmother, his shy stepsister, Njay and Kham sat around in a circle on the floor of the stilt house with me, eyeballing me and giggling when Kham and I were speaking English. I think and hope that they were proud that their son speaks such excellent English and when I tried out my few phrases in Khmu they definitely found that very funny (Samai Leu and Kopar Niem meaning HELLO and THANK YOU are the most important ones and already amuse Khmu people when spoken by falangs). Khmu has a loooot of rolling r-sounds which are easy to imitate so they were greatly amused that I was able to make their sounds. I was offered a glass (or 2) of Lao Lao, the local rice whiskey drink in Laos, and we had dinner together. Delicious green cooked vegetables, some (very spicy) chicken and of course sticky rice. More and more relatives joined the circle after word must have spread that Kham is back in his village with a falang. Here in Laos everyone is considered a cousin, even if you are not really related, so I met a lot of cousins, uncles, aunts and other relatives of the family during my stay. Around 10 pm the mats were put on the floor, a mosquito net was hung from the ceiling and we went to bed, Kham in one corner of the room, his sister Njay and me sleeping next to each other under the net. As soon as I turned to one side Njay snuggled up to me and swung her arm around my waist as if I was her sister or someone she has known for a long time. 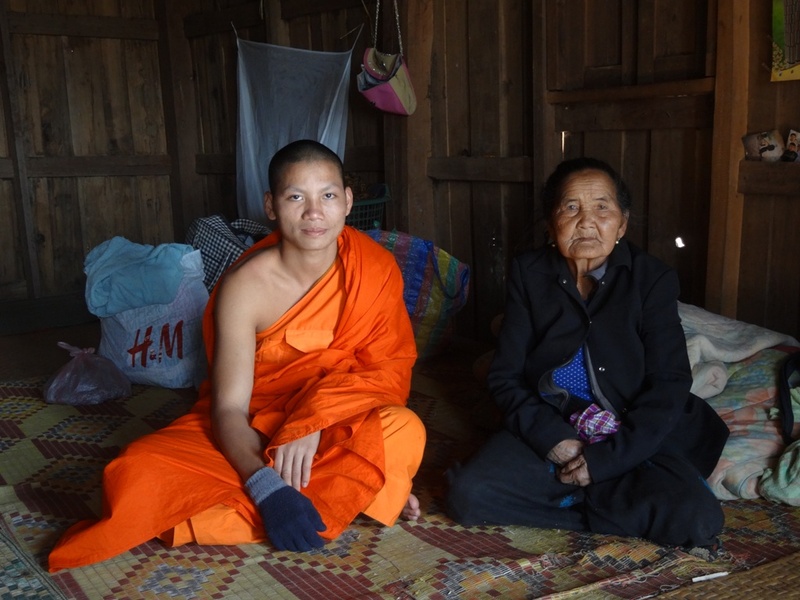 I was extremely happy about this closeness in two ways – firstly because I found it quite brave of her to approach me as she is (like most of Lao people) quite shy and secondly because she had extremely warm feet and hands – something very welcoming in about 4 degrees Celcius. I felt embarrassed and like a wimp to wear 7 (yes, seven!) layers of merino shirts and sweaters, a scarf, hat and gloves in bed while the rest of the family wore only a t-shirt and shorts or a sinh skirt. In the morning we all got up around 5 am and I was rather stiff from sleeping on the floor. 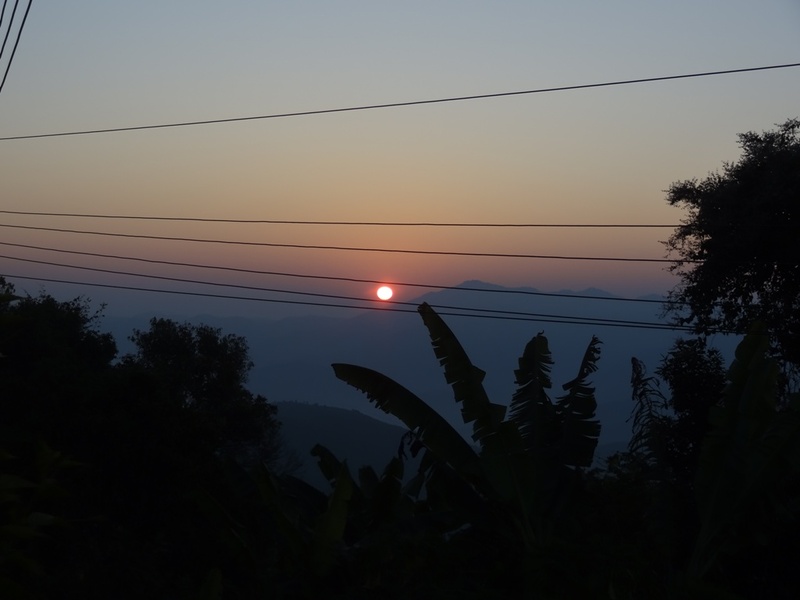 When I walked outside I saw a beautiful purple orange sunrise and thought once again how hard life in little villages in Laos is. 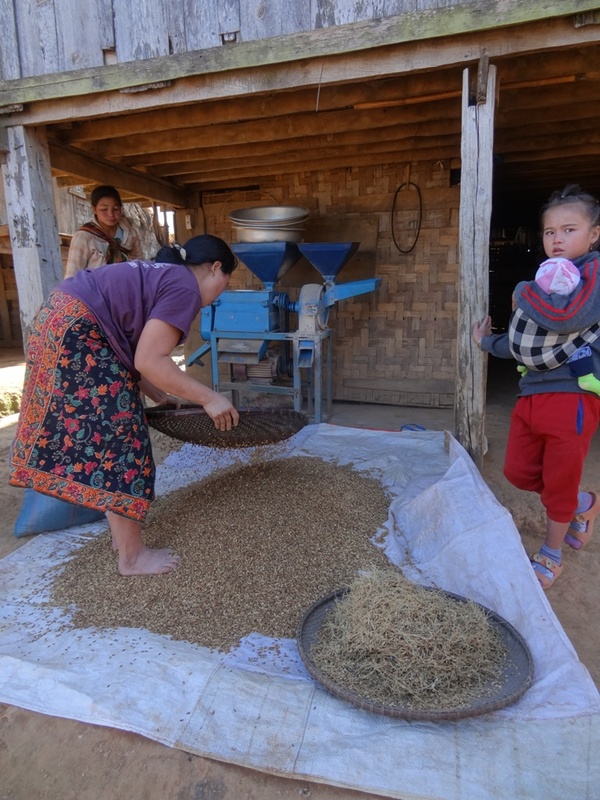 People have to get up very early, work hard on the rice fields in the blazing sun all day and then after their dinner go to bed early as it gets cold and there is not very much light or entertainment in the evenings. We had a wonderful breakfast together, this time Kham was able to eat with us as the night before he couldn’t join us anymore (monks and novices are not allowed to eat after noon). Cooked green vegetables, some minced meat, sticky rice and something else that I couldn’t identify first. An inner voice told me that this brown colored meat could be a four-legged rodent and I asked Kham if this was what I thought it was. 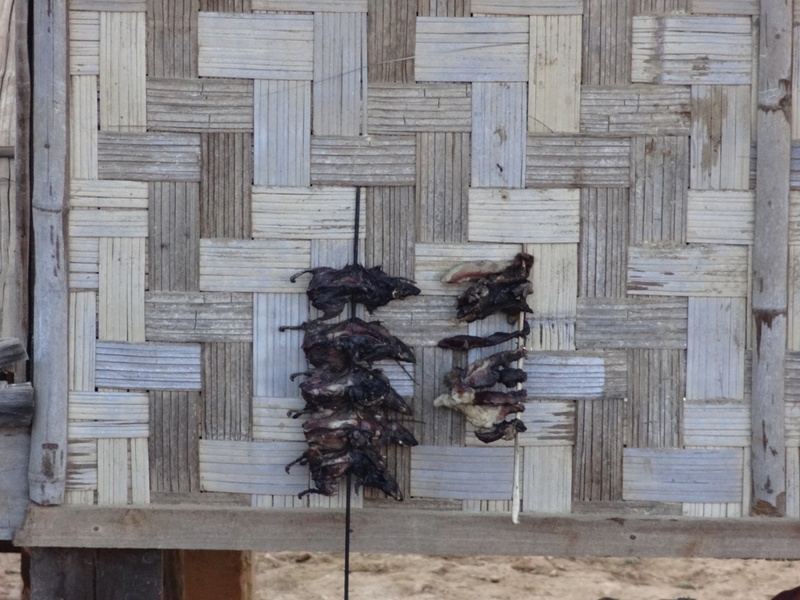 “Yes, it is a rat”, Kham answered, and I clapped my hands excitedly, telling them that I had wanted to try rat since I came to Laos. I was surprised by the taste of it… very intense but good. After breakfast we went for a walk and Kham showed me a little cemetery in the forest where his mother is burried and he explained a lot about the nature, customs and traditions of his village and the Khmu people. 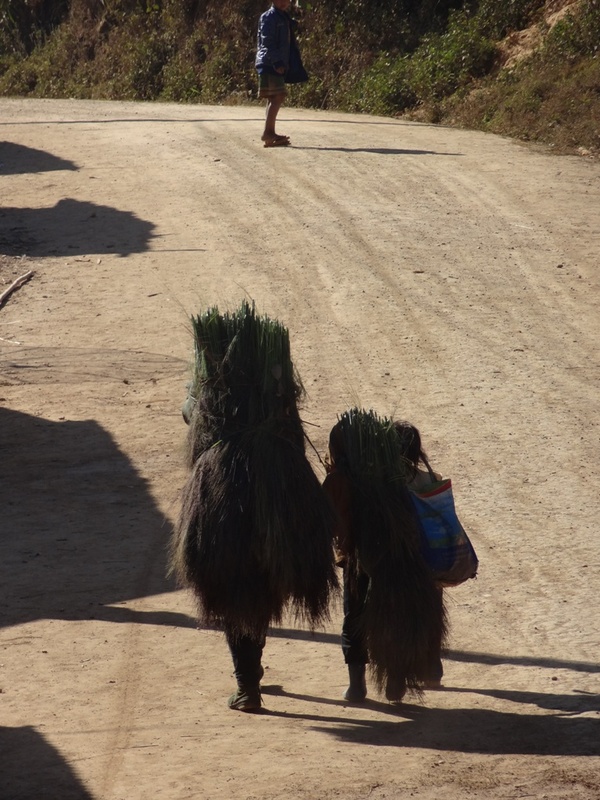 We walked to the next village and met many more relatives of Kham. People were clearly surprised to see a falang walking through their town, let alone a falang together with a novice. 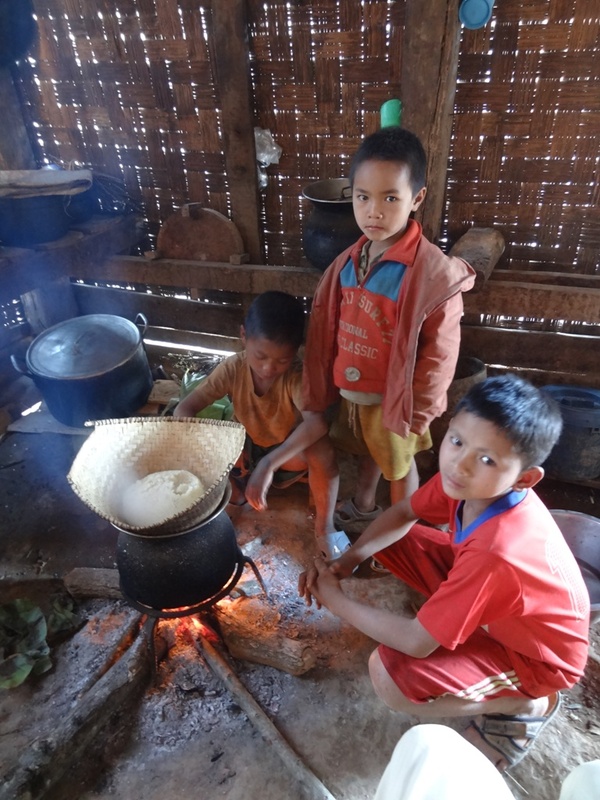 As the sun began to set it cooled down rapidly and we headed back to his village, stopping in one of his sister’s houses who was steaming sticky rice in the house. Most houses consist of one room with a section of it being devoted to cooking. Small coal or wood-fired clay ovens are topped with a steaming pot, a bamboo basket sitting on top of it. The inside walls and ceilings of those houses are charred and it is very smoky due to no air circulation. One thing that still amazes me ever time is the hospitality and generosity of the people – no matter how little they have, they still always offer you something. I got pomelos, pumpkins, stick rice from Kham’s family to take home to Luang Prabang and every time we visited one of his relatives they offered me fruit or sticky rice. When we arrived back in Kham’s village, many people were taking their ‘bath’ at the central water station. A shower you usually find at public swimming pools in Western countries is the place where people shower, of course only ice cold water coming out of the hose. There is no wall and no curtain around the hose, so kids bathe naked, men in their underwear and women wearing their sinhs pulled up. I never understood the concept of trying to wash yourself properly while wearing a skirt from top down to your knees or why the villagers don’t build a simple concrete wall so that they can shower in privacy. Children were playing on the street – some were skilfully carving something with huge machetes (it cracks me up every time I see a 4 year old with a big machete, carving bamboo pieces and thinking of how Western parents would get a heart attack seeing kids with such a tool) , some were chasing down an old rubber tire with stick. As I approached a group of kids and tried to play tag with them one of the little kids started crying like crazy. He was so scared of seeing a falang and I involuntary made hi cry at least 5 times per day every time our paths crossed. 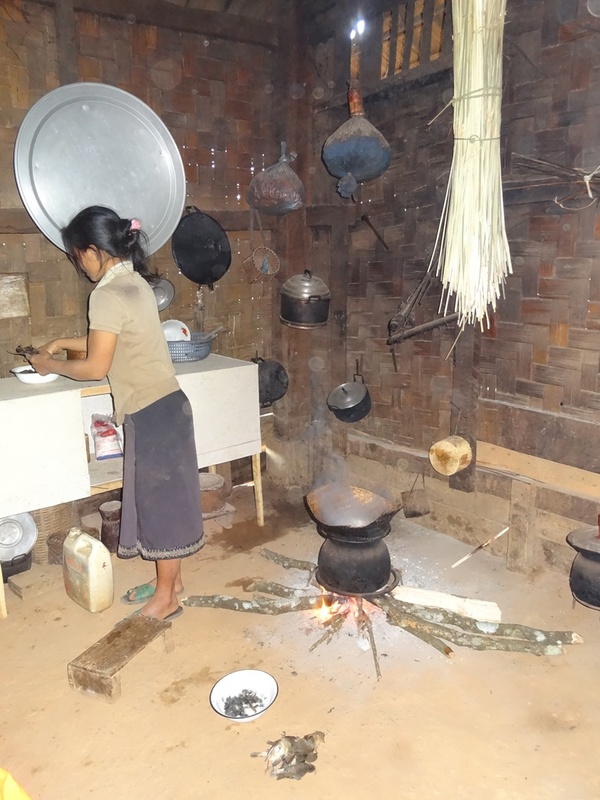 When we got back to the house the whole family had cuddled up in the kitchen, chatting away while Kham’s sister Njay was cooking a delicious dessert made out of pumpkin, tapioka, sweet potatoes, coconut and palm sugar. A bunch of their friends had joined us and some of them were eager practicing their English with the falang. It as such a wonderful evening, listening to cheesy Thai and American pop music, eating together in a circle and telling each other jokes. Later Njay, her friend and I cuddled up under a blanket (this time I got the deluxe-version, two floor mats for a softer sleep) and slept until 6 am. 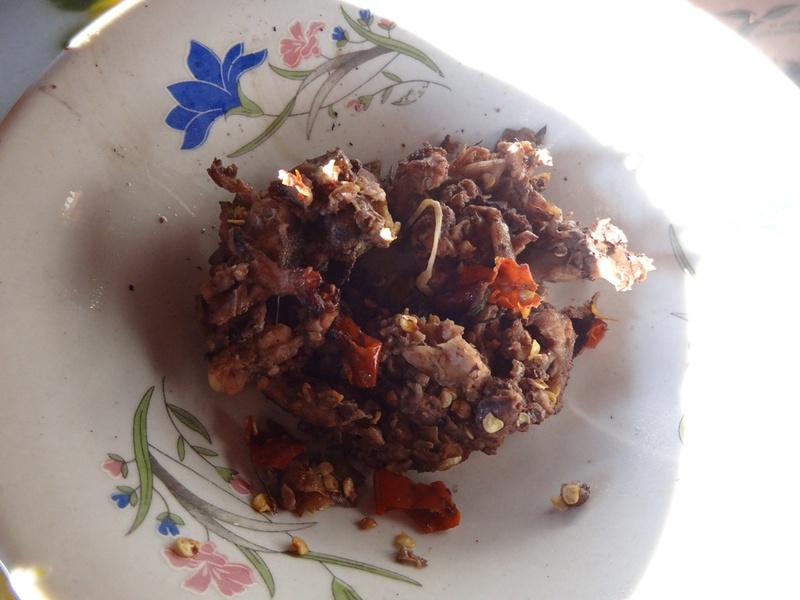 I was the last one to get up (all the other family members had jumped out of bed around 5 am already) and when I climbed down the steps of the house, Kham was working already, pounding sticky rice with fresh poppy seeds in a huge mortar, which made a wonderfully sticky, slightly sweet snack. Unfortunately it was time to say goodbye for me and before I made my way back to Luang Prabang I got a huge stock of sticky rice and vegetables to take home. This experience was unique in many ways. 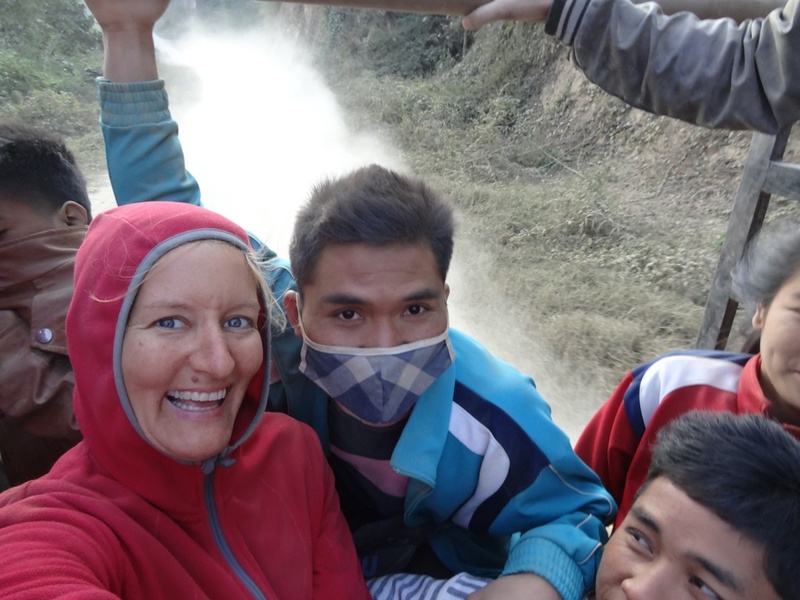 It gave me the opportunity to travel with a friend and be welcomed in a Lao home and it showed me the real life of Laos – a memory I will always cherish and be thankful for. P.S: this blog is dedicated to my student and friend Kham: koparrrrrniem, dear Kham, for taking me to your pretty village and making me feel to welcome in your family. 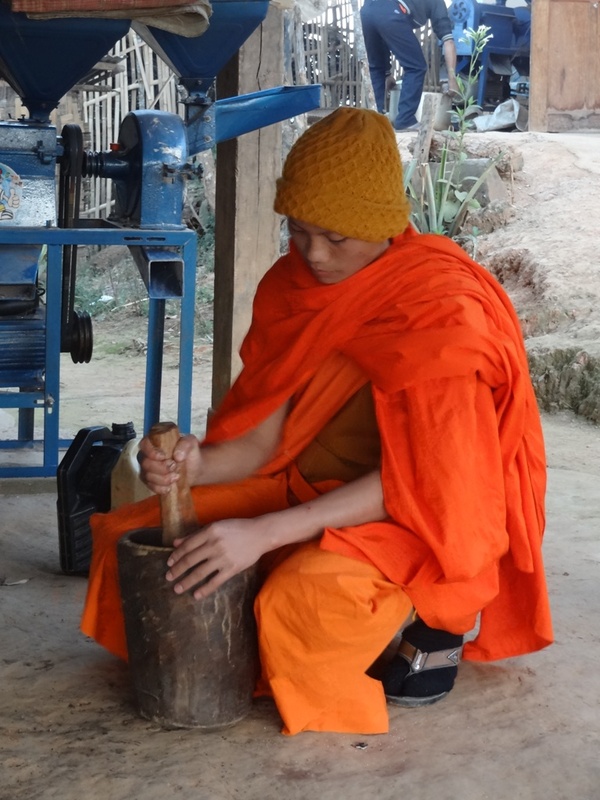 Kham pounding rice with poppy seeds, delicious dessert! Posted by Brita Graser on 2. 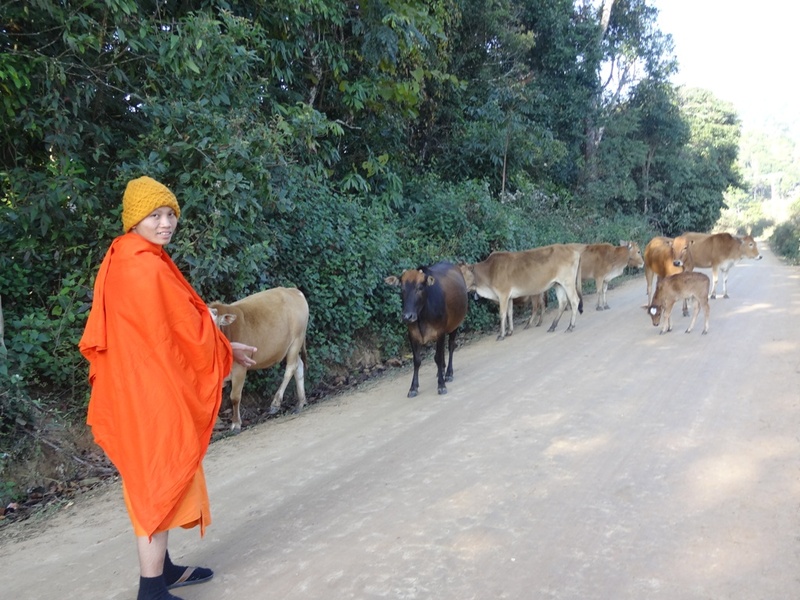 March 2014 in Laos 2012 and tagged MeetingTheLocals, SomewhatUnusualExperiences, traditions. Hello Dam, thank you for reading the story and I am happy you like it! sok dee der! Brita did it again! Again so well written – you feel like being in the middle of the story! LIKE! Dear Brita, i am happy, that you had a nice ,really interresting trip with munk Kham to his village, like we did year ago together similar trip.It was so interresting, that i newer Forget that.